Ask fellow campers about "Capulin RV Park & Camp" and nearby attractions. This is a small RV Park. The whole thing is on big gravel lot. But utilities were great, water was fantastic, WiFi was very good. The owners were very nice. They also sell locally raised grass fed beef that is very tasty but way over priced ($55 for two Tbone thick cut steaks). There are no services in town beyond the country store across the road (gifts, beer, milk, chips) so come prepared. We would happily stay here again. Tried to upload s photo but kept getting an error. 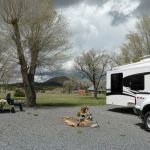 We camped at Capulin RV Park & Camp in a Fifth Wheel. Was merely looking for an overnight stop over while traveling to Colorado. Called and spoke with one of the owners the day I was traveling and made a reservation. Arrived a couple of hours before dark. The owners were very friendly. He drove his ATV and had me follow him to my site to make sure I didn't have any problems. As I parked, he even asked if I wanted a spot a bit closer to the front with better views of Capulin Mtn. which I took him up on. Bathrooms were spotless, good wifi. Separate dog walk area. Will definitely stay here again if my travels take me through this area. 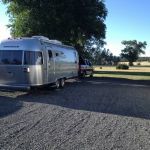 We camped at Capulin RV Park & Camp in a Travel Trailer. Met with a smile and enjoyed a fast, easy check in. The owners are very welcoming and guided us to our site. Park is right off the highway but the road noise isn't bad at all - and, we've slept with the windows open since we arrived. Stayed for a week and have enjoyed our time here... We will be back... We camped at Capulin RV Park & Camp in a Travel Trailer. Our go to stopover to and from Colorado. Not a destination but an overnight spot. You could stay longer and check out the volcano and Folsom...... the home of prehistoric Folsom Man. The Park is clean and the owners are very friendly and accommodating. We camped at Capulin RV Park & Camp in a Motorhome. Small, family-owned and operated, very friendly and helpful. Escorted to site and guided into the back-in site beside the washroom/laundry. Level gravel sites are tight, but big rigs still fit. Very quiet at night, even though it's right beside the highway. We'd happily stay here again. We camped at Capulin RV Park & Camp in a Motorhome. This is an excellent campground. It can be a little crowded when it fills up. The owner does a good job of using space by placing larger units then filling in with smaller units sharing the same utility pedestals. He actually leads and directs each camper in. The National Park Capulin Volcano is nearby and well worth a visit. We camped at Capulin RV Park & Camp in a Motorhome. Capulin Volcano Eat at K-Bob's Steakhouse in Raton and Sierra Grande Restaurant in Des Moines. Had a nice time touring the area around Capulin. The RV park was clean and quiet. Very nice owners. Will stay there again when in the area. Liked that we had sewer hookup for our 3 night stay. We camped at Capulin RV Park & Camp in a Travel Trailer. Pull thru site. 50 amp. Full hookup Owners live on site. Very friendly and helpful. We camped at Capulin RV Park & Camp in a Motorhome. We stayed two nights here as we wanted to visit the Capulin Volcano National Monument. We arrived shortly after noon and the owner asked me if I wouldn't mind taking a chair on the porch while he finished his lunch. Once he was done he took a look at our rig, asked how long we were there for and then offered us a site that had plenty of room for our slide and convenient parking for our truck to so we could come and go. Once we were set up he stopped by to make sure everything was satisfactory. This a small park but the owner is keeping it sparkling clean. If the grounds are any indication I am sure the laundry room and restrooms/showers were just as clean. There is really nothing in the area to do aside from the volcano. There is no grocery shopping that I am aware. This is a great little park to stop for the night and we will stop here again. 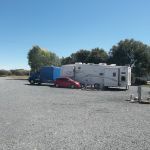 We camped at Capulin RV Park & Camp in a Fifth Wheel. Take half a day to visit the Capulin Volcano National Monument. The welcome center has lots of good information and an educational movie. Then drive to the top of the volcano for amazing views of the northern New Mexico volcanoes (yes, plural). Very nice owners, easy check-in, walked us to site. We asked for a shady P-T site and they gave us one with E & W. Sleep was great because it was quiet and cool. Owners also sell GOOD beef, many different cuts, frozen at reasonable prices. We will return! We camped at Capulin RV Park & Camp in a Travel Trailer. Great park with relatively level sites. We didn't unhook, but just pulled through for the night. Owners live on site and were very helpful. Park is off the main highway, but quiet. Cool temps at night made for a restful stopover. We camped at Capulin RV Park & Camp in a Fifth Wheel. Helpful owners. Pull thru site. No TP in men's bathroom, otherwise very nice site. We camped at Capulin RV Park & Camp in a Travel Trailer. Very nice campground and quiet. Small spaces but if not in use they let you use one next to you. Wifi is really weak I had to go to office porch to use. We camped at Capulin RV Park & Camp in a Motorhome. Owners were very pleasant, escorted us to our site. We pulled in, but had to back out, but it was easy. We were relieved the CG was not full, because if someone had been next to us it would have been very, very close. We also parked our car in that spot, as there was no room behind us for our car. There were random picnic tables around. We were on a street, but traffic during the night was pretty quiet. There were plenty of quiet roads to walk the dog. Site was level, little bit of shade, but we still got satellite. Wifi signal was weak. We camped at Capulin RV Park & Camp in a Motorhome. Went to Capulin Volcano national monument. It was interesting, but not spectacular. The hike to the top was very steep and I was not able to do it. We walked a bit down and a bit up (you can go either way or both ways). Overnight stay on way back to Louisiana after a month in CO. Very nice park with easy pull thru sites. The owners are super friendly and helpful. Everything is clean and neat; the well water is wonderful. We would definitely stay here again. We camped at Capulin RV Park & Camp in a Motorhome. Make sure to visit the Capulin Volcano National Monument located a couple of miles outside of town. No grocery store in area, so buy supplies before staying here. Capulin Volcano National Monument: Visitor's Center; drive to rim permitted for cars, vans and maybe a small Class-B; paved walking path around caldera rim and down to vent, star parties near end of month. Paved trail is steep in places and the 8,000' elevation should be taken into consideration. The little store across the street has some nice stuff but is quite expensive. The campground also sells local beef that is excellent. Capulin volcano national monument is nearby but I don't know that anybody stays here for that reason. At least nobody said so. Tired of drivin? Pull in, sleep, get on down the road. Simple. Capulin Volcano National Monument. The visitor center was also interesting. Capulin has a small county store, with lots of booze, some soft drinks, bottled water, snacks, bread and a gift store. No fuel or restaurants in this little town. No food or fuel in Capulin. Plan accordingly. Close to Capulin Volcano National Monument - a worthwhile visit if in the area. Note: Large vehicles and trailers are not permitted on the road to the caldera. They have a drop off area or simply take the toad to the monument and leave the rig at the RV park. Capulin National Monument, it is worthwhile to walk around the crater-mouth, breathtaking vistas. The owners of the RV park sell all natural fully finished grass fed beef, packed in handy packages to put in your RV freezer. Great taste! This is in a remote area. The campground is about the only thing in town. Mount Capulin Volcano is well worth the visit. It offers great views of the area on the drive to the top. A short walk into the crater and other trails are available in the National Monument. Are you affiliated with Capulin RV Park & Camp ?